While the minnies are at summer camp this week, I’m using the time to myself to prepare for their upcoming birthday party. Today I was brainstorming some candy buffet and tablescape ideas and took a quick inventory of my apothecary jars from the minnies’ First Communion pink and green candy buffet. The apothecary jars are too pretty to store out of sight and look perfect in any room after (or before!) they are used in a candy buffet. Here is some apothecary jar eye candy to inspire you! What a fresh way to display the summer’s freshest fruits! These are adorable in a kitchen or bar area. 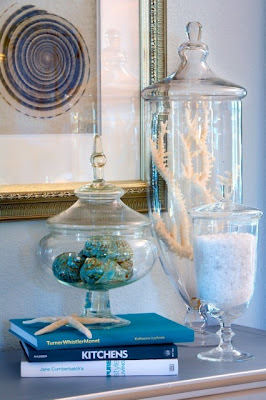 I love this gorgeous arrangement of treasures from the sea. This would be wonderful in a hallway. Place live or cut flowers in apothecary jars as a unique and beautiful alternative to traditional vases. Add a few rocks to provide texture to the display as well as a base around which you can arrange the flowers. Although my laundry room is not even close to being this pretty, I love, love, love the look of this. If there ever was such a thing as a dream laundry room, this is it! 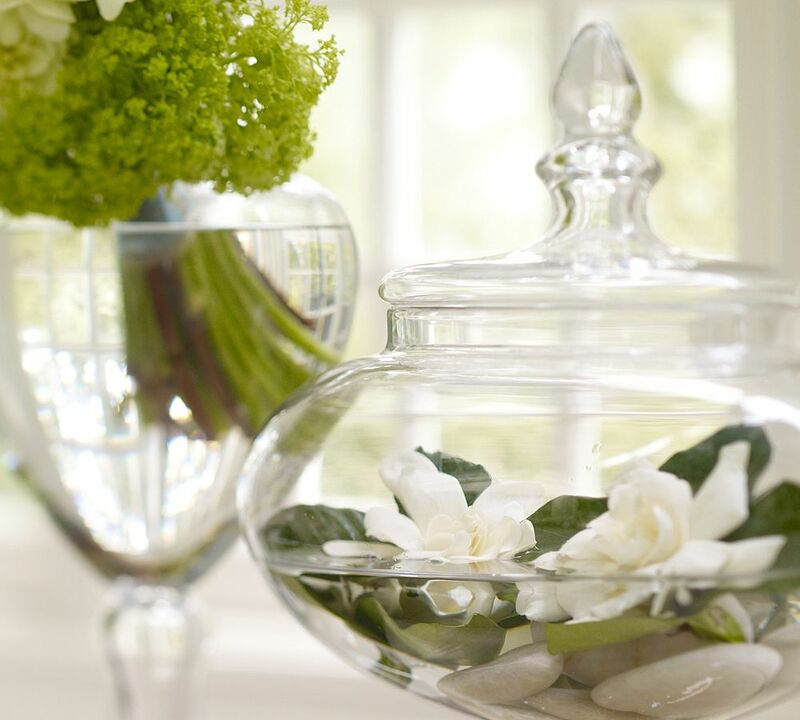 Simple blooms add a touch of elegance in a living room table. I used to do something similar to this when I lived in Mexico, using bright pink bougainvillea. 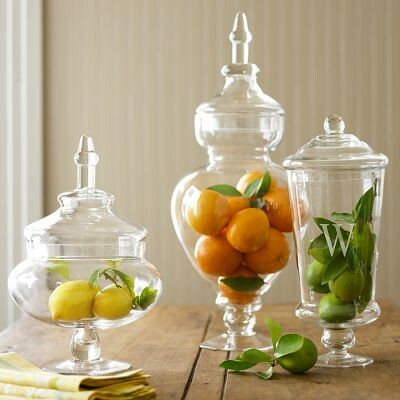 Do you have any apothecary jars at your home? What do you display in them? 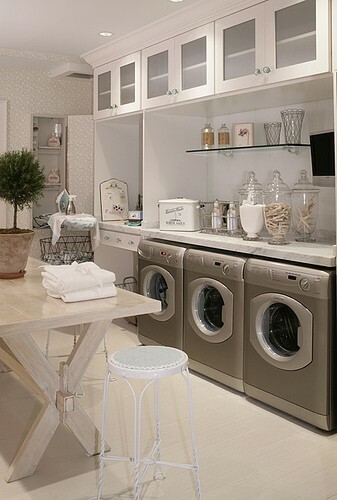 that laundry room is gorgeous! 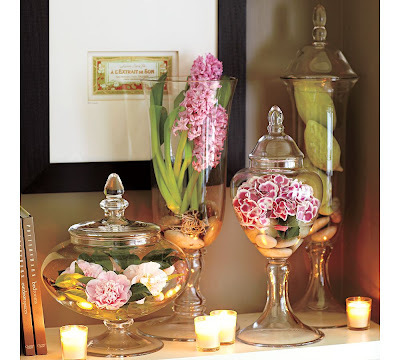 I love apothecary jars as well, I should incorporate some into my apartment decor this upcoming year. I have several small jars that I fill with seasonal colored/festive candy. I love the look of all you have included! Love these looks. I use my jars all the time. I love these ideas! The laundry room one is not only super cute but also practical.